You want a hot take? 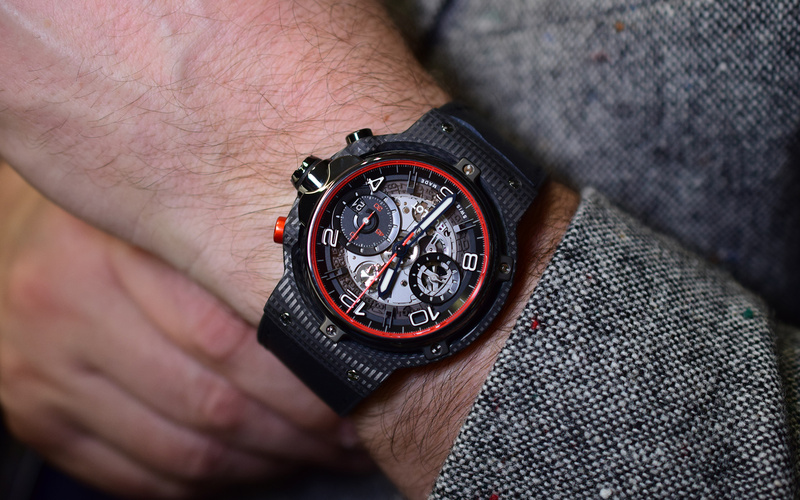 How’s this: Hublot is crushing rival Audemars Piguet with their new releases in 2019. You heard me. A combination of disappointments from AP (the Code 11:59) along with more of the same (additional iterations of the Royal Oak that only top clients at boutiques will ever see) left me sour following their exhibit at SIHH a few months ago. 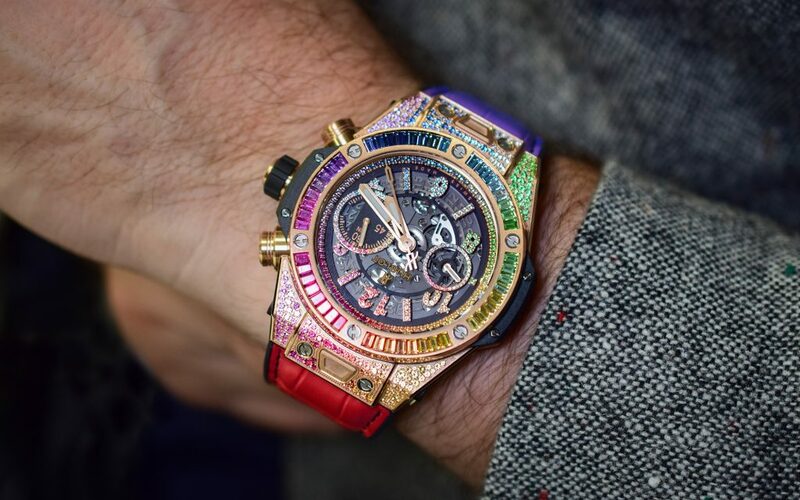 Hublot, benefiting from low expectations, appears fresh and fun with their new line up of Classic Fusions and that absolutely bonkers rainbow thing that Jan went hands on with here. 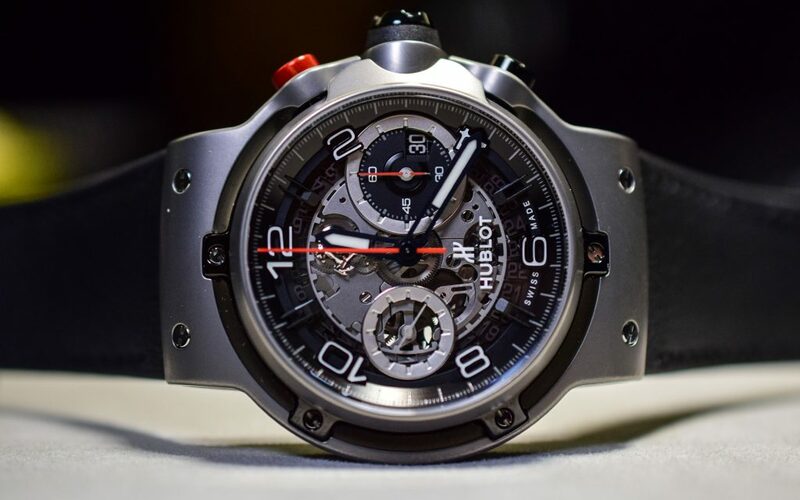 So, here we have the Hublot Ferrari GT. Yes, it’s monstrous in size and loud and, well, people will notice this watch. But for a certain person in a certain situation, it’s probably exactly the message you want to send. 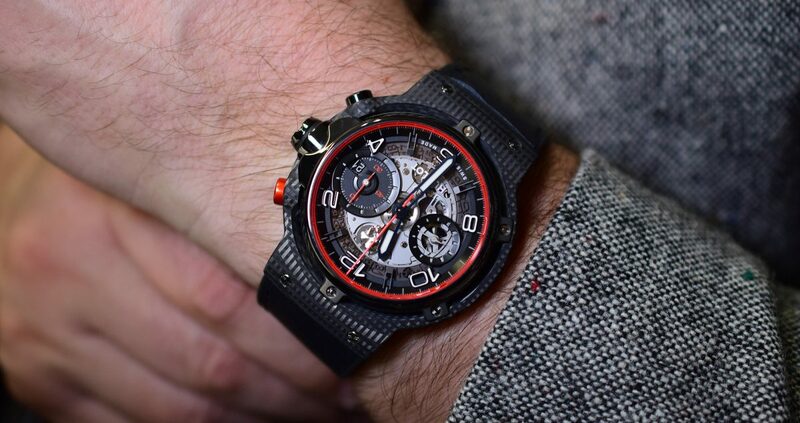 The Ferrari GT comes in three flavors: Titanium, King Gold, and a super special Hublot only material they’re calling 3-D Carbon, which, naturally, looks and feels like carbon fiber, but exists in three dimensions. At least, I think that’s the technical explanation. I’m not a scientist. 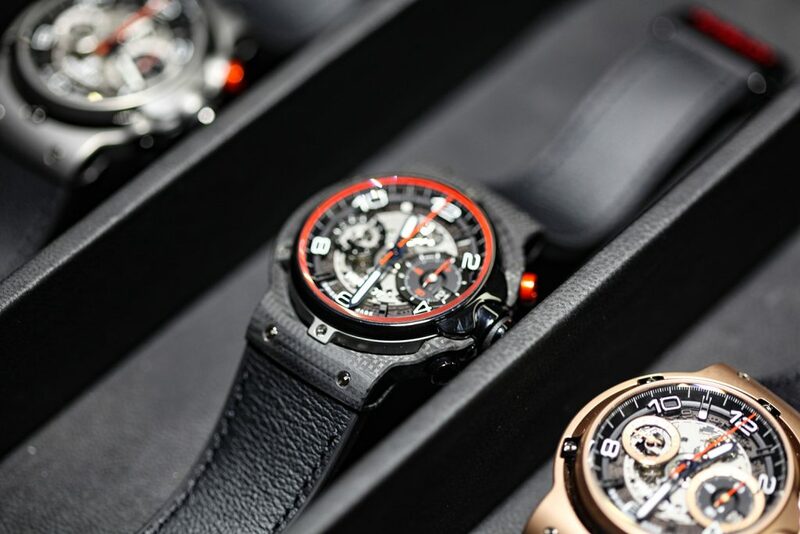 You should probably check out Hublot’s website. Regardless of the case material you choose, you’re looking at a 45mm case diameter, which is definitely big, but not necessarily the absurd giant you were expecting. Nobody will call this watch refined or conservative, but for a big watch, there’s a sleekness to the Ferrari GT that makes sense when you consider the supercar link. Was this developed in a wind tunnel? Probably not, but I think we’ve all seen plenty of chunkier watches. 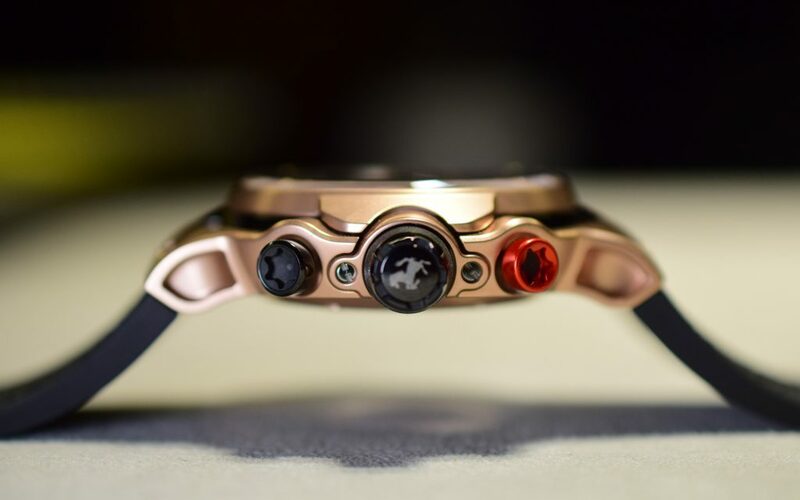 The design of this watch is meant to sit low on the wrist and be more wearable than a 45mm watch has any right to be, helped by the low weight of the titanium and 3-D Carbon models. The dials are open worked, and the lugs have a cool open design as well, probably the most car like element of the case design. I’ll be honest, I don’t think “Ferrari” when I look at these, and were it not for the prancing horse at 12:00, I wouldn’t see the connection at all. 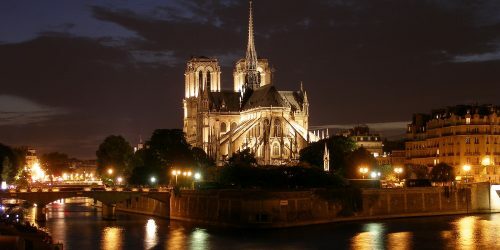 Realistically, I think the most significant connection is simply the wealth and strength of ego required to throw down for either luxury item. 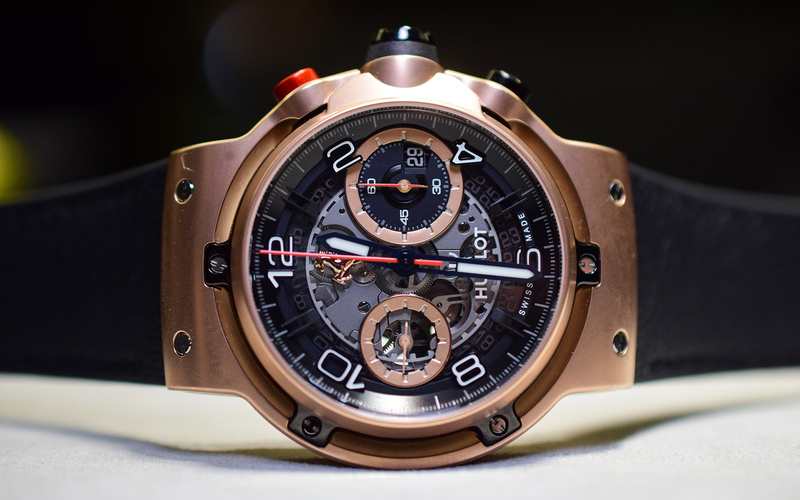 This watch has a flyback chronograph, and this where I think it makes sense to address some of the general criticisms Hublot has been the recipient of in recent years (really, since the company’s inception). I’ve always been of the opinion that Hublot gets a bad rap. While the watches aren’t generally my style, and the styles are almost happily derivative of iconic watches from other brands, there are pieces in the catalog that deserve attention on the basis of their horology and their crazy materials. 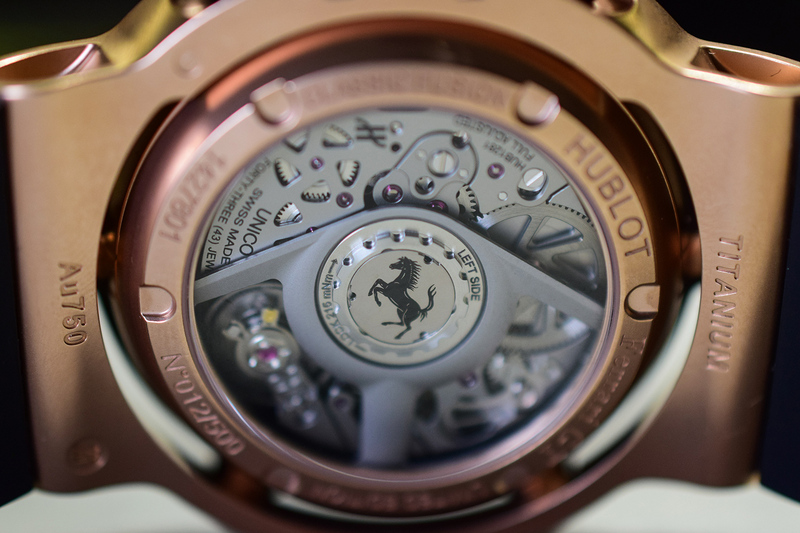 This is a brand that does, after all, have an in-house minute repeater movement in its arsenal. 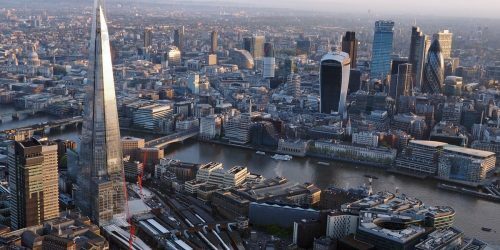 And it doesn’t cost six figures to own it new, and if you want it used, it’s discount city. My point is simply that if you can get past the “image” of Hublot, there’s value for money with this brand. And getting past the image of any brand, at the high or low end of the spectrum, is something we should all strive for. Buy what you like, and all that. 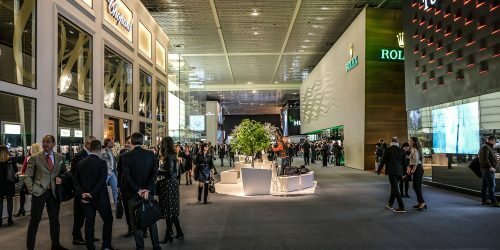 At this year’s Basel, with the absence of the Swatch Group brands exhibiting, Hublot and other brands in the LVMH stable (as well as plenty of independents) had a chance to grab some headlines. Hublot now stands out as a distinct counterpoint to Audemars Piguet, whose Royal Oak is an often cited inspiration on the Big Bang. Just consider for a moment the tone of the Code 11:59 launch. You’d think AP was introducing a box that that tests your blood for hundreds of ailments with just a pin prick, and not a watch. They were just a few notes too serious. Hublot, on the other hand, has the heir of not caring even the slightest bit. Their new watches have the Ferrari logo on them, and jewels of all colors. They are loud and not very practical, but they make you smile when you look at them. They’re having fun. I know with every fiber of my being that I’m not a Hublot customer. It’s one of the very few things in life I’m just too conservative for. But I’m glad that this brand exists. 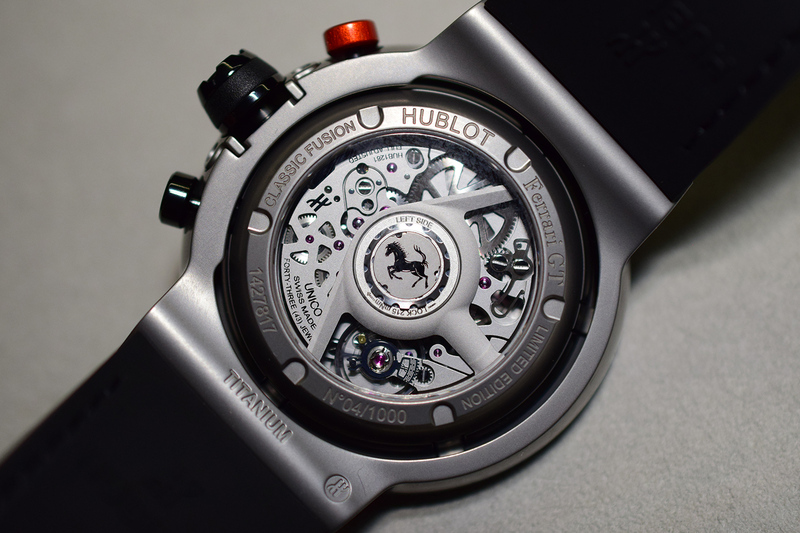 There needs to be a watchmaking firm that is unapologetically loud at the very high end. Hublot isn’t alone in this space, of course, but they offer an aesthetic that while not completely unique, absolutely finds a particular customer, and that’s really all they need to do to be successful. Besides, how boring would life be if every high end watch came in the same precious metals? Fantastic read Zach! Such refreshing honesty on a watch blog. I`m in no way anywhere close to the Hublot/Ferrari target group, but I have to agree with you, they had some very interesting and fun releases at Basel. Love the collabs with the artists as well, did you guys capture those at BW?